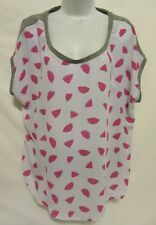 Torrid Dolman Sleeve Top Watermelon Gray Grey Womens Plus Size 0 Blouse NWOT! Mud Pie Sports Baby Tooth Curl Keepsake Set Baseball and Football Boy NEW! Robeez Robby Black Baby Boys Leather Crib Shoes Size 2 (3-6M) RB41968 Quality! Kate Spade NY Teal Gold One In a Million Initial Card Holder Letter "S” NEW! Dorothy WIZARD OF OZ Tapestry Throw Blanket Acrylic Mohawk 50" x 60" Brand New!